It hasn’t just been the kids we’ve welcomed to the farm this summer, though; I have also had a handful of new horses sent to me for training! I’m always ridiculously excited when I have a new one in training, so to get a few all at once was like Christmas morning for me. (Thank you Becca Macanas and Kathy Ashrafi for the new toys, I promise not to break them!!!). It has been a blast bringing these talented green-beans along, and they’ll be making their debut at a CT very soon! Along the lines of new, exciting happenings…in June, my trusty working student Ashley and her super-supportive mom Laura went on a road trip with me to Charles Town Racetrack in West Virginia. It was a first trip to the track for the girls and a very eye-opening experience for both. (I really should have written a blog post titled, “I Remember MY First Day at the Track…” but it’s been a busy summer, guys!). My method for finding Thoroughbreds at the track is to throw on breeches and tall boots (not typical track attire) and walk around asking if anyone has something “sound and sane but slow.” Most people see me and can tell I’m not from around there, which can either lead to them showing me an old 15-hand track pony with bowed tendons and trying to pass it off as a it off as a 17-hand 4-yr-old with no injuries whatsoever, OR saying, “Hey, I’ve got this guy who’s just not running fast enough – are you looking for a Jumper or something? 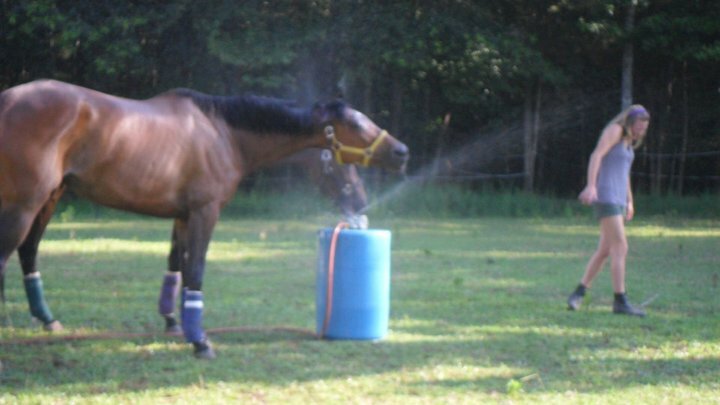 He jumps over water puddles…” (I actually bought a horse on the “he jumps water puddles” line back in ’05…Casanova is, to this day, one of the nicest horses I’ve ever found at the track). Flawed though this technique may be, it’s worked out pretty well for me, and I’ve been super lucky in bringing home some really fantastic horses this way. 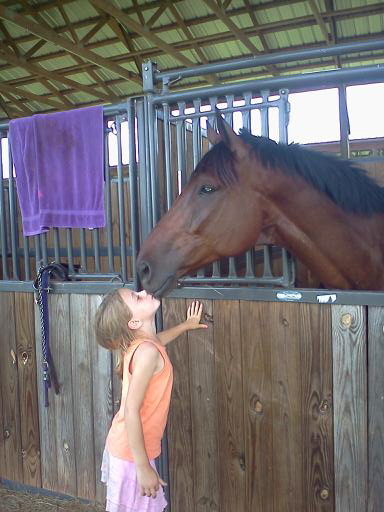 The two we picked out this time are no exception – a lovely 7-yr-old 16.3 hand bay mare whom my neighbor bought the moment we got home with her, and the 5-yr-old 16 hand bay gelding Ashley bought. “Noah” is already showing great promise and has turned out to be quite the ham, just like Pirate…we’ve been calling him P’s mini-me, in fact. I’m excited to see what the future holds for this pair! 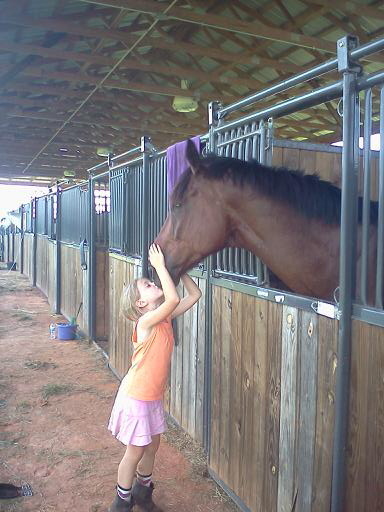 Congrats to Ashley on her first horse. Speaking of congrats, I need to congratulate the Hamiltons on their purchase of Jasper, the 9-yr-old 16.1 hand grey TB I’ve had in my barn to school and sell for the Davis family. I don’t know why it didn’t occur to me until recently that Elena Hamilton (age 6) and Jasper would be a good match, but it has less to do with Jasper (a total saint) and more to do with the fact that I can’t quite believe my little Elena (whom I’ve known since she was born) could possibly trot a big TB around the arena all by herself. The Hamiltons are a second family to me; I have known them since I was a 12-yr-old kicking Laddy around Novice, and they have owned many of the horses – often OTTBs – I’ve trained and competed through the years. For several years, I was even a nanny for the 3 Hamilton children, so selling Jasper to them is really just keeping it in the family. Elena will literally be jumping HER first cross-rail on Jasper, and he’ll be a great horse to show her the ropes…because it certainly can’t be my (in)famous Laddy Pony, who is still wild as fire at 20 years old. Anyway, all this talk of what’s to come makes me all excited to get out and compete again, which is exactly what I’ll be doing this weekend. Tomorrow, Pirate and I hit the road to Tennessee to run at River Glen, where we’ll both be crashing with my dear friend Holly http://4stargazing.blogspot.com/ (if you don’t already subscribe to her blog. DO IT – she is way better at keeping up with hers than I am with mine). Naturally, getting to hang out with Holly makes this event feel like vacation for me, because isn’t this supposed to be FUN, at the end of day? With all the blood, sweat, tears, and oh yeah – MONEY – we all put into this, it better be. And no matter how seriously we all have to take this sport sometimes, I sure hope we can always approach it with the same enthusiasm that we had for our first cross-rails…because we totally rocked those, or at least we thought we did, and sometimes, that’s all that matters. 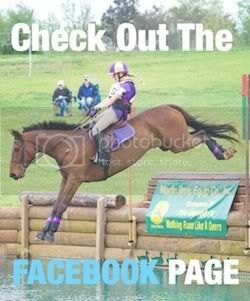 Posted in Blog and tagged with Cross Country, Fox Hollow Farm, Horse trainer, Kelsey Briggs, Kelsey Briggs eventing, The Gentleman Pirate, Three Day Eventing, XC. RSS 2.0 feed. « Pirate could fake a British accent, right?